International attention may be Ali’s only hope to end his abuse and secure his release. 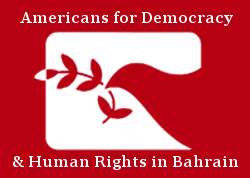 Click here for details on how to send a letter to Bahrain’s king urging his immediate release. Ali Isa Ali al-Tajer is a Bahraini citizen and the brother of Mohamed al-Tajer, a prominent human rights lawyer and human rights defender in Bahrain. Mohamed al-Tajer has worked with the United Nations Secretariat, including the Office of the High Commissioner for Human Rights and the Special Procedures, on several occasions and is a well-known supporter of their work in Bahrain. Mohamed fears that the Government of Bahrain may have targeted Ali in retaliation against Mohamed’s human rights work and assistance to international human rights organizations. On 5 November 2015 at approximately 5:00 PM, plainclothes and uniformed security offices believed to be associated with the Ministry of Interior (MoI) surrounded Ali’s house with eight police cars, additional civilian MoI cars, and a police bus. Upon surrounding the house, 10 masked security agents forcibly entered the building through the back door. They arrested Ali and confiscated his mobile phone and other electronic devices. During the arrest, the security forces terrorized Ali’s family and children, including his two-year-old infant. At no point did they present either an arrest or search warrant. MoI forces transported Ali to an unknown destination. They allowed Ali to call his family approximately one hour after the arrest. During the call, Ali told his family that he had been taken to the General Directorate of Criminal Investigations (CID). He was unable to provide any further information, as the phone call was cut off. When Ali’s family went to confirm his detention at the CID, CID security agents denied having him in custody. After several days, Ali called again, asking that his family bring clothes to the CID building. However, when his family attempted again to go to the CID, CID security officers again denied having him in custody. When Ali’s attorney attempted to contact the CID to confirm his location, CID officers again denied having him in custody. 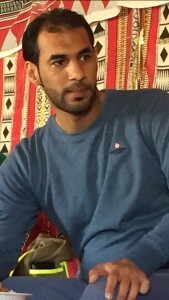 On 30 November 2015, after holding Ali in incommunicado detention for 25 days, the public prosecution called his brother Mohamed al-Tajer to represent him at court. Upon arrival, Mohamed noticed that the hearing had already been in session for some time. He states that, upon initially observing Ali, Mohamed noticed that Ali was pale and clearly in a state of fright. Ali later stated that the prosecutor had threatened him prior to Mohamed’s arrival. During the trial, the prosecutor behaved in a manner inconsistent with the requirements of justice. He verbally abused Ali. He threatened to have one of Ali’s attorneys removed from court when the attorney told Ali that he had the right to deny the charges. The prosecutor charged Ali with joining an illegal terrorist organization for the purposes of violently overthrowing the government and with training others on the use of weapons for the purposes of terrorism. Ali denied these charges. At one point during the hearing, the prosecutor produced a confession from Ali stating that he had performed the criminal acts in question. He stated that the charges to which Ali had confessed would be enough to sentence him to life in prison. Ali stated that he had been tortured into signing the confession. He also stated that he had been blindfolded at the time of signing, and had not been given the opportunity to review the papers, but that he had been forced to sign them anyways. At this point, the prosecutor interrupted Ali, telling him to stop explaining the torture he faced. He stated that he would transfer the allegations to the Special Investigations Unit, who would examine them for veracity. Ali’s attorneys demanded that Ali be subjected to a thorough medical examination to determine the veracity of the torture allegations. After the hearing concluded, Ali’s attorneys were allowed to sit with Ali for five minutes. Bahraini security officers monitored the meeting and attempted to record the conversation. During the meeting, Ali related that Bahraini security officers had severely tortured him during the period of his incommunicado detention, including beatings, humiliation, and sexual assault. Ali’s family and lawyer have submitted a complaint to the Bahrain National Institute for Human Rights. It is currently unknown as to whether or not the Special Investigations Unit is investigating Ali’s allegations. However, based on previous experience with the institution, the family believes that the investigations of the National Institute for Human Rights and the Special Investigations Unit will prove futile. The abuse that Ali has experienced fits the pattern of torture and abuse that has continued with impunity since 2011, most recently documented by Human Rights Watch and ADHRB’s latest report, Shattering the Facade. This case constitutes yet another abuse of Bahrain’s expansive anti-terror laws to violate fundamental human rights and intimidate those who defend them.